Our guides were phenomenal! Melissa and Justin did a great job of getting us down the Colorado River and explaining what we were seeing and telling us about the history of the area. Travis and Lat took good care of us as well. They were on the other boat, but Lat did most of the general announcements, and they both did some great cooking as well. We always felt safe and well looked after. Travis, Justin, and Melissa entertained us on the final night with some sing-along songs, and we really enjoyed that too. 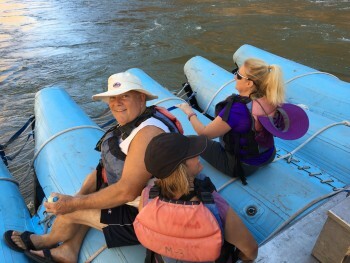 We had a blast going through the white water up on the bow when we were underway. Hiking to the Travertine Grotto waterfall, and jumping off the cliff into the river were some of the other fun things we did. We highly recommend this Grand Canyon 3-day trip!! !